measure RCS of such radar targets as aircraft, ships and automobiles. "Radar Test Systems / Radar Evaluation Systems / Radar Measurement Systems ( Mellimeter∙Micro Wave)" are here. KEYCOM develops and manufactures various radars, radar systems and altimeters that will meet your specific requests, for quantity as small as one. Our experts in high frequency engineering design them by using our original analysis tool that is comprised of our expertise accumulated over the last 20 years. The designs are then verified based on our prototype models or high-performance 3 dimensional electromagnetic analysis tool. *Fluid flow analysis KEYCOM develops and manufactures prototype automobile radars, selectable either 76GHz or 24GHz, FMCW or pulse radar. Customization of data output is optionally available. Because it is a specified low power device, no radiotelephone license or certification is necessary. This FMCW radar is not only with 76.5GHz, 1GHz band but also with 79GHz, 4GHz band. It can measure distance, relative velocity, signal level accurately. KEYCOM develops and manufactures different area monitoring radars. You can select 60GHz or 24 GHz, and FMCW or pulse radar as the technology to be used. We provide custom data output tailored to your system specification. KEYCOM’s synthetic aperture radar RAD01 watches for signs of disasters such as a fracture of a bank, a rock fall, collapse of a tunnel, a landslide, and so on, for 24 hours a day. It detects a displacement as small as 0.1mm and alarms. It detects a displacement as small as 0.1mm and alarms. KEYCOM develops and manufactures various radars, radar systems and altimeters that will meet your specific requests. 1.The reflective mirror attached to the flat frame ensures that the directionality of reception and transmission coincide. 2.The transmission and reception antennas are separated, ensuring that the received and the transmitted signals are isolated from each other. 3.Snow does not lie on the radome because it is slanted. 4.The radome can be easily removed. • Millimeter-Wave (94GHz band) weather radar. • Capable of observing the development of clouds. • The FMCW method enables highly sensitive observation with low power. • Observation is possible with pyramid-shaped, fan-shaped, or fixed beam. 1. Antenna’s directional angle continuously variable 10° to 2° through dielectric lens antenna. 2. Its log amplifier enables highly accurate receiving level measurement, and converts it to DC voltage. 4. Because it is a specified low power device, no radio license or certification necessary. 1. Because it is a specified low power radar, no radio license or certification necessary. 3. Detailed data analysis is possible as the received signals can be stored in CSV format. This radar performs highly precise distance measurement in the range between 50cm and 35m. 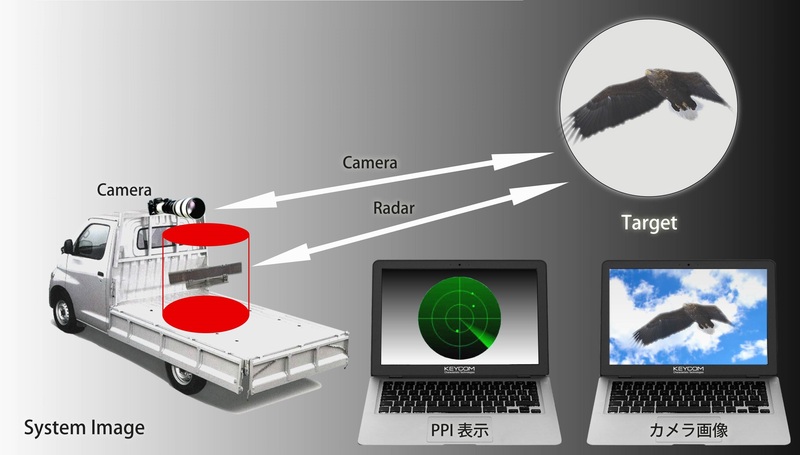 Because it is a specified low power radar, no radio license or certification necessary. Network operation allows high extensibility and remote monitoring. Aerosols, and Radiation Explorer) (The observation sensitivity is 10 dB-higher, or further higher than the radar mounted on satellite EarthCARE.). This instrument is a millimeter-wave (94 GHz band) weather radar. It can penetrate fog and smoke, which is diffi cult by optical methods. The azimuth is swept mechanically and the elevation is swept electronically. The antenna is slot array type. Used for the checkup of the cloud radar mounted on satellite EarthCARE (Earth Clouds, Aerosols, and Radiation Explorer). Confi gurable array antenna (e.g., zigzag confi guration). Phased array receiver for a Millimeter-Wave (94 GHz band) weather radar. The grating lobe of the electron scanning direction can be mitigated by changing the confi guration. The gain and phase shifting are accurately adjusted for each RF receiver module so that each RF module does not have a phase shift. Therefore, the phase shifter is installed for each fan beam (linear array).